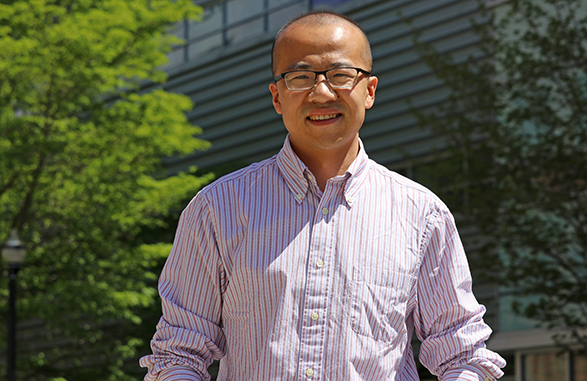 Lei Wang, assistant professor of Geodetic Engineering, is the recipient of the National Aeronautics and Space Administration (NASA) New Investigator Program (NIP) award in Earth Sciences. The resources associated with the NIP award will afford Wang the opportunity to further his research, in which he applies multiple sources of geodetic measurement data to more accurately quantify current and future environmental changes in the Greenland ice sheet. "The Greenland ice sheet is melting rapidly, and is the greatest contributor to the present-day sea level change," said Wang. "The global sea level will rise by seven meters if the Greenland ice sheet melts completely." As a result, "a lot of major coastal cities, such as Boston, Miami and New York, would be underwater." Wang integrates Gravity Recovery and Climate Experiment (GRACE), GPS, satellite altimetry and Interferometric Synthetic Aperture Radar (InSAR) to construct a composite "picture" of climate change in Greenland. He stated that the accurate observation and quantification of the present melting status of Greenland ice sheets and other ice sheets or glaciers, is critical for the projection of sea level change in the next several decades. "This is a critical component for the disaster risk reduction/response decision-making that meets the urgent needs of the coastal regions in the world," he said. Professor Wang joined the faculty of the Department of Civil, Environmental and Geodetic Engineering in 2016. Prior to his appointment at Ohio State, he served as postdoctoral research scientist at Columbia University and as a postdoctoral associate at MIT. Wang received his B.Sc. and M.Sc., both in Geodesy and Geomatics, from Wuhan University (China). He subsequently earned his Ph.D. in Geodetic Science and Surveying from Ohio State in 2012. The New Investigator Program was established by the NASA Office of Earth Science in 1996 to encourage integrated environments for research and education for scientists and engineers at the early state of their professional careers.